The new Youi Headquarters with 59 DALI universes and over 500 Sensors programmed to both daylight harvest and sense occupancy sets new standards in lighting efficiency. Please contact us for help with your next project. The 12,500sqm, four-level building will house Youi’s current 1000-strong Sunshine Coast workforce by the end of the year. 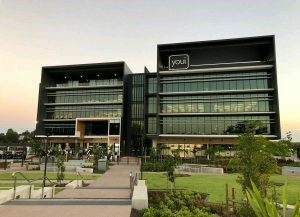 It is hoped to hold up to 3000 staff members as Youi grows and consolidates its South African and New Zealand operations.